Looking for more tips on how to shop like a local when you visit Paris? Be sure to get our 2019 INSIDR Paris Shopping Guide! Paris may be the gastronomical capital of the world, with no shortage of quality restaurants, brasseries and cafés, but it is difficult to avoid a trip to the grocery stores during your stay. 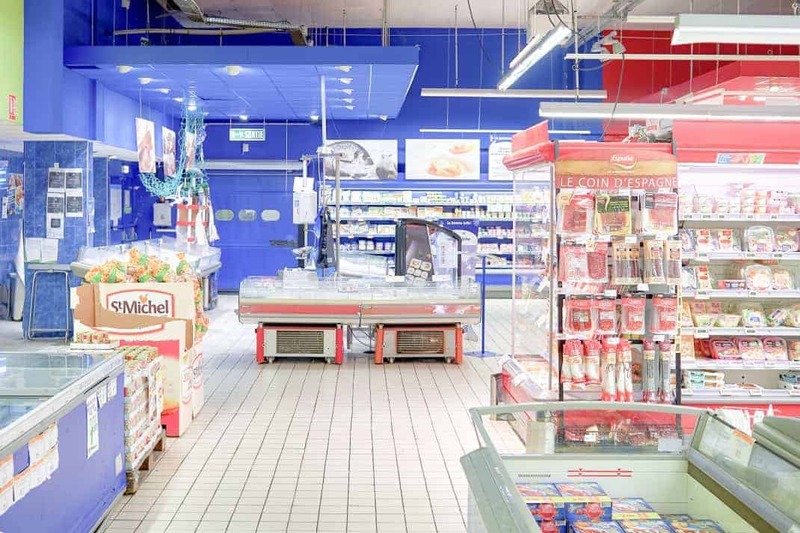 Whether you need to whip up a euro saving dinner, need some emergency basics or want to stock up on traditional French items, INSIDR is on hand to demystify grocery stores in Paris and France. The Franprix supermarket chain has the most grocery stores in Paris though not necessarily all of France. You will find at least one Franprix in almost every arrondissement. Whilst this grocery store is not a particularly budget option in France nor Paris, they do stock the brand “Leader Price”, one of the cheapest store brands available. This store is ideal for basic grocery needs. Many Franprix stores are even open on Sundays and until 10 PM at night, which is rare in France! Carrefour offers a large selection of brands in its stores. Within central Paris the grocery stores are smaller but just outside the peripheric and elsewhere in France are many large scale Carrefours, comparable to Walmart. These stores will sell a range of groceries, electronics, house hold items and occasionally clothing. Up for both France’s and Paris’ most classy and prestigious grocery store shopping experience? Galeries Lafayette could be an exquisite choice for you. Fine quality on a huge diversity of international deli and fresh produce is absolutely guaranteed, plus an indoor market place including fishmongers, oyster bar, foie gras stands… You name it! Feeling cosy but still fancy quality items? Their home delivery services would fit your wish for a Sunday lie-in. Picard is France and Paris’ chain grocery store that exclusively sells frozen goods. The quality is usually very good, so if you’re looking for freezer friendly cheat meals, Picard is not a bad shout! Prices vary, but are reasonable for the quality. Monoprix is another very common supermarket in Paris. There are a number of larger Monoprix markets in central Paris which sell a large range of brands and products. They often have home furnishings, cosmetics and electronics sections too. Monoprix also sells its own clothing line which is good quality and in tandem the latest Parisian trends, but it can be rather pricey. Boulangeries can also be found in some Monoprix stores. There are also smaller Monoprix markets called Daily’ Monop dotted around Paris. Although they sell various brands, Monoprix is one of the more upmarket, expensive grocery stores in Paris and wider France. Lidl is one of the favourite budget grocery stores within Paris and France, meaning they can often be very busy! Lidl is very affordable and tends to have a good selection of seasonal fruit and vegetables. Whilst Lidl has many of the basics, and also a great “on offer” range, they don’t have everything, so you may have to do a top up shop elsewhere. Naturalia is a popular bio food grocery store that is present in many places within Paris and wider France. They usually stock a good range of produce from fresh bio fruit and vegetables, dried fruit and nuts, meats and fish, bio cosmetics and medication. The price range is expensive, but not more than you would expect from a bio store in a capital city! If you are on the hunt for rare ingredients while in Paris or elsewhere in France then Bio c’Bon is a marginally cheaper grocery store option than Naturalia for you, though still fairly pricey. They have a good selection of produce and hard to find items for special diets. Customer service in Supermarkets isn’t quite like it is in the States or elsewhere, you’re have to pack your own groceries at the cash register. You often, but not always, have to weigh your fruit and vegetables- don’t find that out too late when you’re already at check out! Be warned that most grocery stores close before 9 or 10 PM and—apart from a handful of Franprix stores—are rarely open on Sunday. Store brands are consistently cheaper than name brands, though the quality is not remarkably different. If you are set on buying organic, Monoprix offers a large organic range which may be cheaper than shopping at an organic store. As an alternative to the big grocery stores while you’re travelling in Paris or wider France, classic French markets are still a popular way of sourcing goods. There are many markets that take place all around the city. Quality and and price range vary, but they remain a fantastic way to purchase seasonal and local produce. Check out our article about the best outdoor food markets with local produce in Paris.